The cutie, the hottie and the extra ordionary coming together in the movie Battleship Island. The movie is set to release in 2017 first half. So ji Sub was the main reason to make Battleship Island an addition to our movie quelist. The plot seems interesting a Japanese colonial era where Korean people were forced onto Battleship Island “Hashima Island” to mine for coal. The face hardships and tried to escape. The real story starts when Lee Kang-Ok (Hwang Jung-Min) is a bandmaster at Kyungsung Hotel. He decides to go to Japan to protect his daughter, but he is drafted into Battleship Island by force, being deceived by talk to send him to Japan. On Battleship Island, he does anything to protect his daughter. 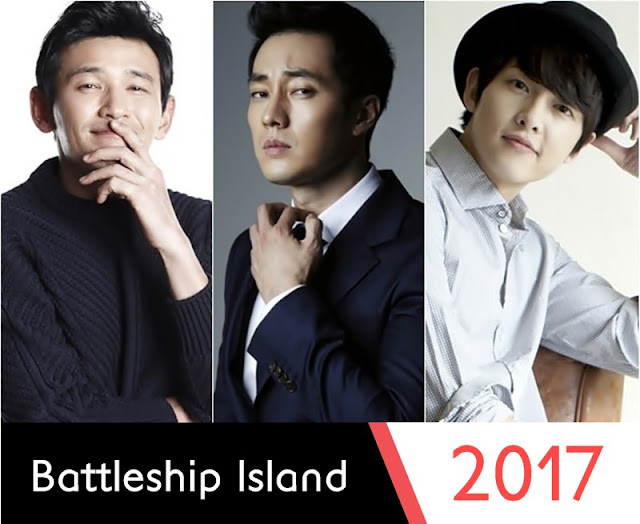 So we are rooting up for Battleship Island featuring So ji Sub, Hwang Jung-Min and Song Joong-Ki.